Super simple breakfast filled with eggs, cheese and sauce! Heat the tortillas in the microwave for 30-45 seconds. In a saute pan sprayed with cooking oil, crack the eggs and give a quick stir with a fork. Don’t over stir. Fold eggs a few times until thickened. Fold in the cheese and sauce until cheese is melted and the eggs are cooked to your liking. 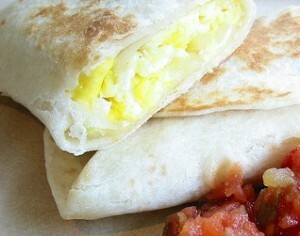 Stuff the tortillas with the egg mixture and roll up. Keep the sauce on the side if you wish!